Sleek design; Sturdy build; Rich social networking experience; Great sound quality. Lacklustre screen; Disappointing camera; Lacks front-facing camera; Half-baked maps. 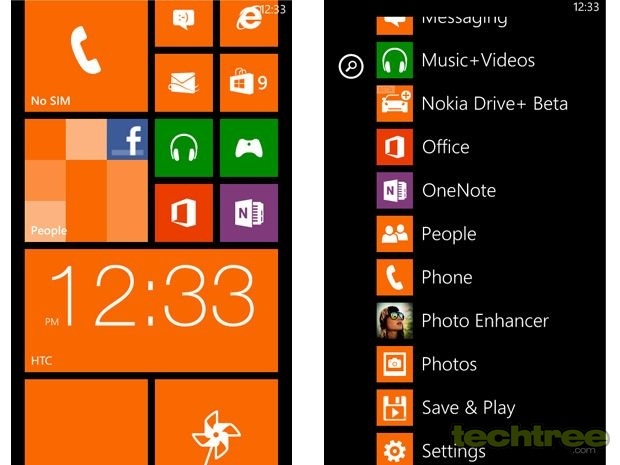 While HTC's flagship Windows Phone 8X was good, it got overshadowed by the Nokia Lumia 920. But the the 8S is on another turf altogether — it fills a void between the Lumia 820 and 620. By that reasoning, this phone doesn't have any direct competitor, at least for now. 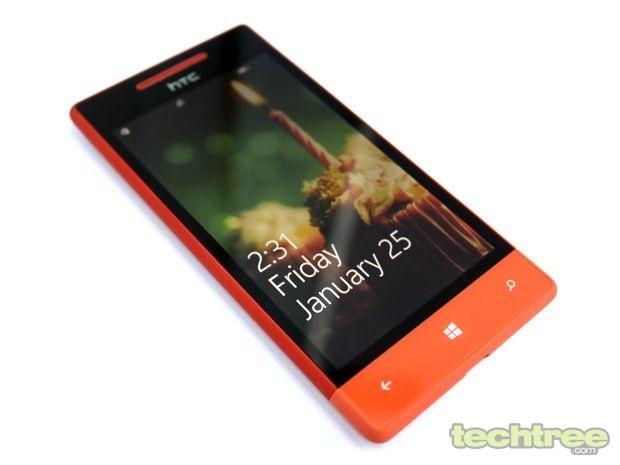 The The bold design of the HTC Windows Phone 8S is rare for this price tag, so that's another plus. This WP8 phone packs in a dual-core CPU and a 4" screen; just like its Android counterparts. 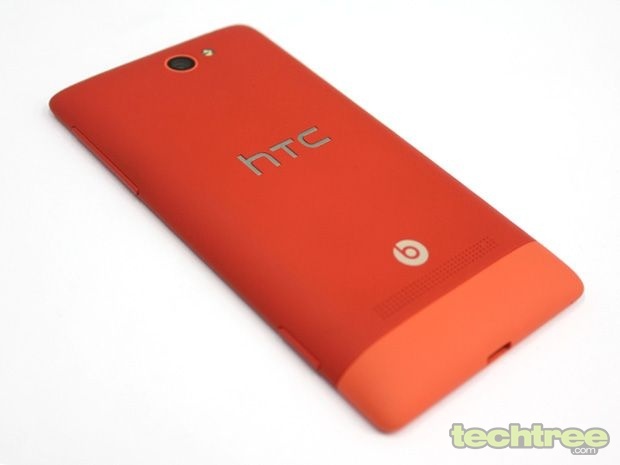 The HTC 8S looks much like its older sibling — save for the dual-tone design at the back. Apart from the orange handset that we received for review, the 8S is available in blue, black, and gray. At 10.3 mm the phone isn't very thin, but the tapering edges make it look slim. The microSD and micro-SIM slots are secured under a removable cap. Opening this cover is quite a tricky affair, and once inserted, it's very cumbersome to remove the SIM card. On the bright side though, the handset is quite sturdy and lightweight. The phone features a polycarbonate unibody design, with soft rubberized finish at the back, which helps with the grip. Undoubtedly, the 8S is one of the most beautiful sub-20,000 handset available in the market. However, it could have looked even better without the dual-tone colour scheme (but then, looks are subjective). One gripe I've here is the placement of the Lock button, which is quite inaccessible (at the top). Leaving that annoyance aside though, this handset is perfect for single handed operation. Overall, the design and build quality is very good. The 8S features a 4" S-LCD screen with 800x480 pixels, protected by Corning Gorilla Glass. Although not pixel-packed, the display is sharp. But the screen looks washed out, and its colour reproduction is anything but accurate. Similar to the 8X, this phone displays dark grey instead of blacks. All these petty issues spoil the WP8 experience, since Windows Phone platform is all about bold colours and dominant black. Another let down is the screen's lower-than-average refresh rate, which makes text blurry when scrolling. This phone is powered by a Qualcomm Snapdragon S4 chipset with a 1 GHz dual-core CPU and Adreno 305 GPU. Other bells and whistles include a 5 mp camera, 4 GB internal storage, and Beats Audio integration. Full specifications are at the end of this review. Let's quickly run through the most important WP8 features. For starters, you can now customise Live Tiles with three sizes. The OS now offers mass storage mode and Bluetooth FTP for easy file transfer (these are standard WP8 features). As mentioned in earlier WP handset reviews, the Children's Corner lets you create a separate homescreen for your kids. Only selected content will appear in this section — think of it as a guest account for your phone. Other changes include an improved lock screen that can display updates from apps, and pull background images from Bing and Facebook feeds. As you may already know, the social networking experience is top-notch with WP8, and this mobile phone is no exception. A lot has been said about Google blocking some of its services on the Windows Phone platform. During my testing though, Gmail, YouTube, and even calendar sync worked without a hassle. So either the search giant has caved in to increasing criticism, or Microsoft has found a way around the restrictions. Since WP8 Maps are now being powered by Nokia's map data, you can access maps offline. The Finnish company has opened up its Drive software to non-Lumia handsets in the US, Canada, and Europe; and HTC hasn't developed any navigation app to put this data to good use. So in India, the Nokia's satellite navigation app is still exclusive to the Lumia series - a pity. The Office Suite is excellent and no matter how many alternatives the rival platforms have, nothing comes close to Microsoft's offering. The mobile version of IE10 is blazing-fast at page rendering, and is fully compatible with HTML5. Microsoft's Store has over lakh apps, which should be enough for most (all ?) users. True, many popular games haven't made it to WP, but it houses enough unique titles to keep you occupied anyway. With the arrival of mass storage mode, desktop Zune client is no longer needed to manage media on WP devices. The default music player's offers a neat and clutter-free interface. HTC has duly added their signature Beats audio sound enhancement, but there are no equalizer settings as seen on Nokia's WP8 handsets. That being said, the phone delivers great sound quality. The phone's Snapdragon S4 takes care of MP4 videos up to 720p. However, AVI and MKV videos are a no-go on the in-built media player. The 5 mp autofocus has an LED flash to keep it company. It offers many settings such as face detection, white balance, exposure, contrast, ISO, saturation, contrast, and a couple of effects. The phone also comes pre-installed with HTC's Photo Enhancer app that offers Instagram-like filters. On the lenses applications front though, the HTC doesn't have anything exclusive up its sleeve. 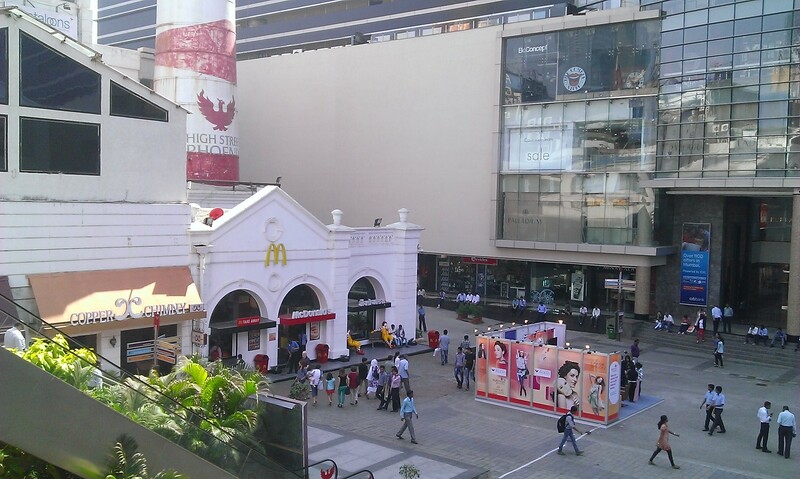 The images produced by the camera are disappointing - seems mostly due to HTC's aggressive sharpening algorithm. The camera tends to overexpose, so the brighter parts of the scene get washed out. Click here, to check out the untouched sample. The device is capable of recording 720p video at 30 fps in the MP4 format. Playback is smooth and the clips contain decent amount of detail. People Hub as usual wins you over with its deep social networking integration. 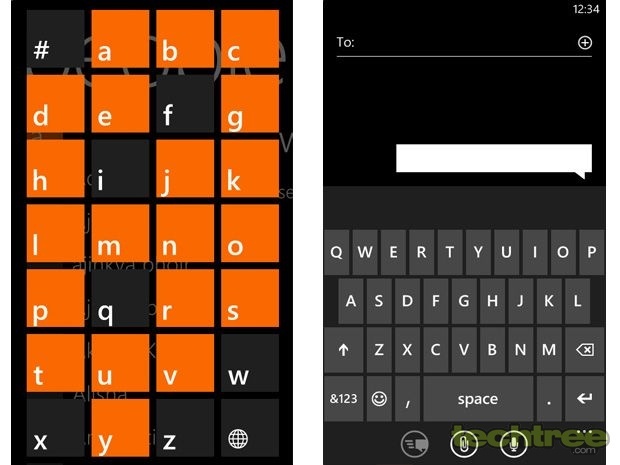 The WP8 on-screen keyboard is extremely responsive and thoughtfully designed. The handset's call quality and network reception were good during our tests. Other connectivity features such as Wi-Fi and 3G also worked fine. With its 1700 mAh Li-Po battery the 8S easily lasts for a normal work day. In our 720p video loop test, it lasted around 5 hours, which is just about average for a dual-core phone. The 8S is a beautiful handset with good build quality. The WP8 OS and the handset's sound quality are impressive. On the flipside, the camera is disappointing and the phone lacks a proper sat-nav app. The biggest downer, however, is its mediocre screen. Overall, if you're ready to make a switch from Android, the 8S is a good deal at the 20k mark. On the other hand, if you're not a fan of Microsoft's mobile platform, or you just are too committed to Android, you are better off with the Samsung GALAXY S Advance. 4" super LCD touch screen with WVGA resolution and Gorilla Glass protection. 1 GHz dual-core Qualcomm S4 processor with 512 MB of RAM. 5 mp rear camera with autofocus LED flash, F2.8 aperture and 35mm lens capable of 720p video recording; lacks front camera. 3.5 mm stereo audio jack, Bluetooth 2.1 - EDR, Wi-Fi: IEEE 802.11 b/g/n. 4 GB internal storage with expansion microSD card slot for additional storage. G-Sensor, Proximity sensor and Ambient light sensor. Embedded 1700mAh rechargeable Li-ion Polymer battery. Measures 4.7" (l) x 2.5"(w) x 0.4" (10.28 mm) (d); weighs 113 grams.